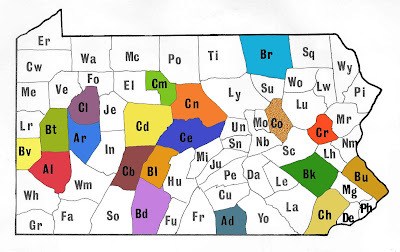 This week our travel through the archaeology of the Commonwealth by county takes us to the last of the C’s –Cumberland County. The terrain here is characterized by its setting in the Great Ridge and Valley province it resides in, low rolling hills and a broad valley floor. This terrain provides rich soils along floodplains to support a range of flora and the rolling uplands offer forests comprised of oak, chestnut, hickory as dominate with maple, white pine, cherry as some of the secondary components. Fauna include whitetail deer, bear, beaver and during prehistoric times included elk, martins and fishers. 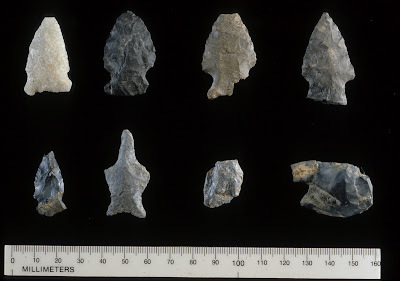 This setting provided a habitat desirable to Native peoples as early as the Paleoindian period (16,000-10,000 years ago) as evidenced by at least one fluted point found in a low swampy area along the Yellow Breeches. The lithic resources available to Native peoples for tool production included quartz, sandstone and metarhyolite from quarries in the Blue Ridge Province at South Mountain. Archaeological evidence of Native peoples in this county is apparent in the relatively high number of prehistoric sites, 174 out of a total of 212 sites that have been recorded for the county, which equates to one site every 2.63 miles. The Archaic period and the Transitional period are represented primarily by short-term processing camps and lithic reduction sites. An investigation conducted for a sewage treatment plant in Hampden Township yielded evidence of resharpening of tools utilized in the processing of large mammals, possibly deer or elk. This period is typically marked by small bands of people coming together to hunt and fish seasonally, and processing foods at these camp sites. The greatest number of sites represented in the prehistoric period is from the Late Woodland (1,100 to 400 years ago). This period is marked by a shift to intensive horticultural practices and larger, more permanent settlements. 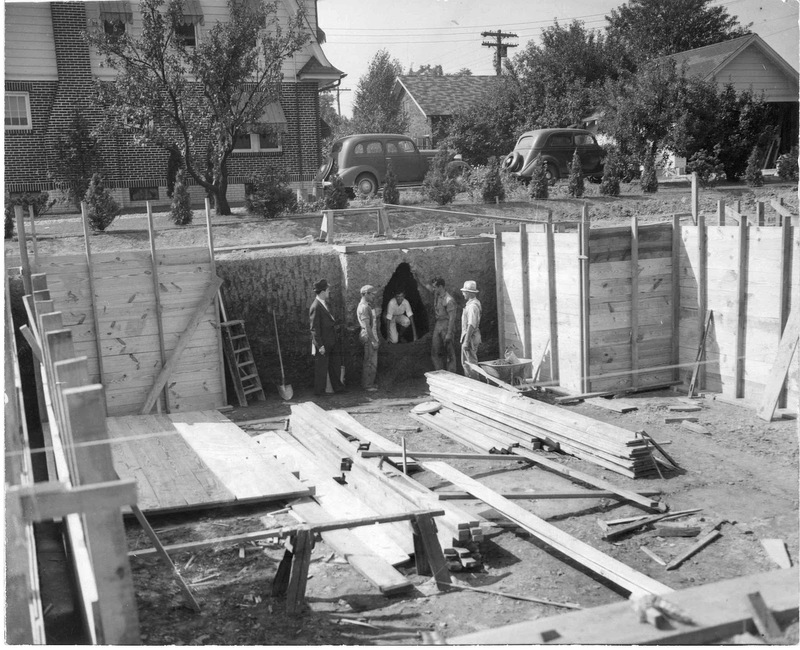 Construction of a home in Camp Hill Borough in 1936 resulted in the discovery of a storage pit. A discovery in Camp Hill in 1936 while excavating a basement for a new home provided a glimpse into early food preservation practices of Native groups. A large storage pit which measured 52 inches wide at the bottom, 33 inches at the top and was five foot, ten inches in length was uncovered. Newspaper accounts which reported the discovery lists the content of this bell shaped storage pit as charred corn and a grass mat or shallow basket. 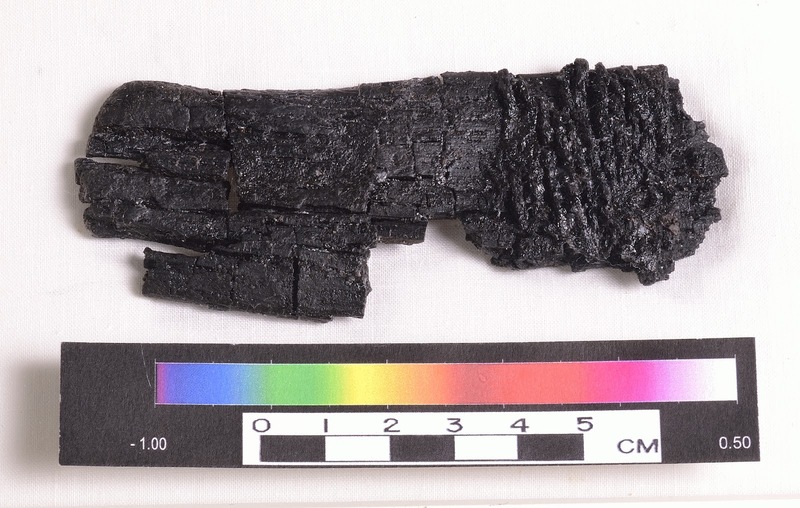 A small quantity of this charred corn resides in the collections at The State Museum. 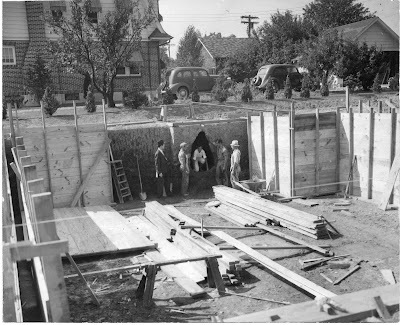 The homeowners recognized the significance of this storage pit feature and preserved it in the foundation wall of their home, which still survives today. Empty refuse pit at 36Cu194 following careful excavation of dietary remains by archaeologists. A recent archaeological investigation conducted in Lemoyne Borough on a summit overlooking the Susquehanna River produced further evidence of site use by Native peoples during the Late Woodland. This site is only a few miles from the storage pit described above. The Lemoyne site (36Cu194) has provided archaeologists with evidence of a Susquehannock site dating between 1575 and 1625 A.D. 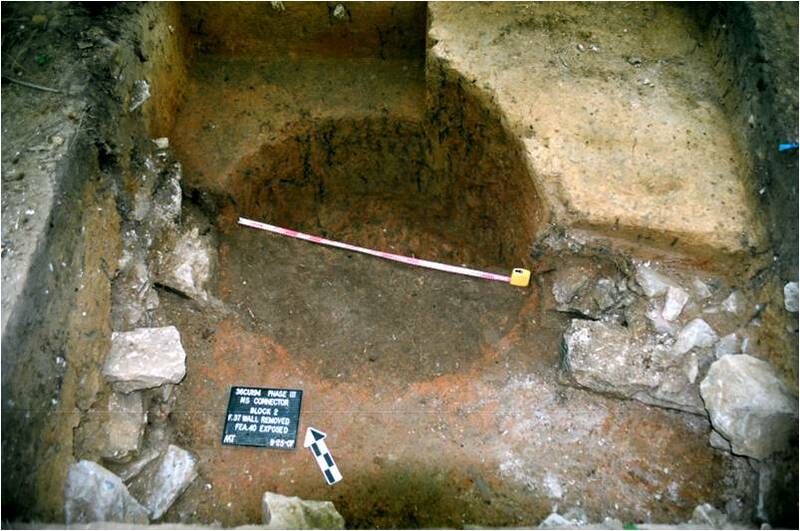 This site uncovered a small section of a palisade, possible house structures and silo and bell-shaped pit features. Floatation of the contents of these pit features produced evidence of corn, beans and squash- known as the “Three Sisters”. They also provided evidence of subsistence based on these crops and local resources such as fish and deer. This allowed archaeologists to compare processing methods at this site with faunal remains from previously excavated sites in the lower Susquehanna Valley. One of the differences identified was the lack of any evidence for axe butchering marks, a possible indicator of a culture change in either the availability or function of axes. The archaeology conducted at this site has helped create a more accurate picture of the Susquehannock settlement pattern in the lower Susquehanna Valley , but at the same time it also raises questions for archaeologists that can only be answered through further research and analysis. Dietary evidence recovered at this site has provided a more complete picture of the subsistence practices of the Late Woodland and early 17th century periods. The careful excavation methods employed at this site allowed for extensive analysis that is not always possible when sites have been destroyed by development or looters. The curation of this collection will permit further analysis in the future as archaeologists continue to examine culture change and settlement patterns in the area. It is almost unimaginable as you drive through the maze of traffic and development to think that only 250 years ago Cumberland County was considered the western frontier. The county was formed in 1750 in response to a petition from settlers in the western portions of Lancaster County who pleaded that the distance to courts in Lancaster created undue problems for them. They argued that they needed the courts to protect them from the “idle and dissolute” who escaped to the wilderness of the western regions. Cumberland County became only the sixth county in Pennsylvania. One of the early settlers of this region was George Croghan whose property became the site of an archaeological investigation in 1988 for an I-81 Connector Project. Croghan was a land speculator and Indian trader. Early records indicate he owned approximately 800 acres on the Conodoguinet Creek by 1748, he owned 200,000 acres surrounding Pittsburgh and he had rights to more than a million acres from Pittsburgh to Erie. Croghan operated trading posts in multiple locations and because of his experience with Native peoples was identified as a negotiator for the Provincial government in dealing with Indians in the western portion of the state. Historic background research of the Croghan/Weibley site (36Cu105) revealed that Croghan only retained the property until 1751 when he sold it and the land continued to change owners. The property was utilized as a farm and a woolen factory with a connected oil mill. Improvements included the construction of a brick house and stone barn. Archaeological investigations also uncovered a Late Archaic component, in addition to a 19th century farmstead. This western frontier of Pennsylvania underwent a great deal of change in establishing the settlements of the county. The Native peoples who occupied the region prior to European settlement were being forced from the lands they had traditionally hunted and fished upon. The new settlers wanted the lands for farming and expansion away from the crowded southeastern portions of the state. This settlement conflict resulted in the construction of multiple stockade forts for protection from Indian raids on settlers. Carlisle, the present day county seat was the site of Fort Lowther as early as May, 1753. 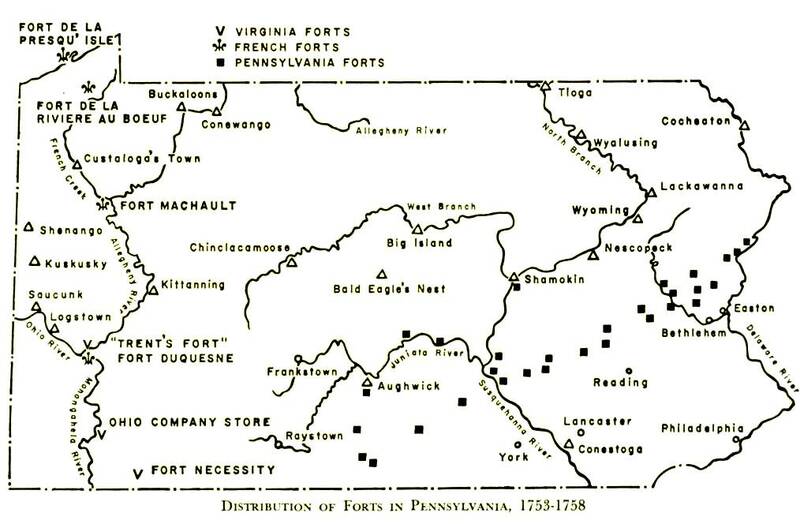 Raids throughout the entire “western frontier” attributed to the construction of forts including Fort Morris in 1755. Archaeology conducted at this site by Stephen Warfel has provided evidence of the fort in the form of personal effects, military equipment and dietary remains. The exact location of Fort Morris has eluded researchers for years, but archaeology conducted in 2008 and 2009 supplied direct evidence of the fort. Archaeological evidence revealed soil features, including a stone lined cellar, and artifacts datable to the fort time period. Artifacts recovered at Fort Morris include musket balls, buttons, and ceramics. French & Indian War research has been an important focus of the Pennsylvania Historical & Museum Commission. Our excavations at Fort Hunter and previous excavations conducted by the Commission at Fort Loudoun and Fort Augusta contribute to our understanding of this turbulent period in Pennsylvania history. The Workshops in Archaeology program scheduled for November 3rd will focus on this period of change from the Contact period through the end of the French & Indian War in 1763. We hope you will mark your calendars to join us as archaeologists from around the state present their findings of these significant sites. We hope you have enjoyed our trip into the archaeology of Cumberland County and we have inspired you to learn more about the archaeology of your county. Preserving our past benefits each of us, we hope you will help us in protecting and preserving the archaeological heritage of our Commonwealth. All References for this week's blog are from the Unpublished Manuscripts File of The Section of Archaeology, The State Museum of Pennsylvania. Phase I Archaeological Survey, Wetland Mitigation Area and Phase II Archaeological Survey Croghan-Weibley Site (36Cu105) Prehistoric Component, I-81Connector, L.R. 1067, Cumberland Co, PA.1993. The Discovery of Fort Morris: A Report on 2008 Archaeological Investigations at the 333 E. Burd Street Site, Shippensburg, PA. 2010. Phase III Archaeological Data Recovery Investigations at 36CU194; Proposed Norfolk Southern Railway Company Rail Connector Project; Memorial Park, Borough of Lemoyne, Cumberland County, PA. 2011. This week we move to the northern reaches of the Allegheny drainage basin and the glaciated Appalachian Plateau. 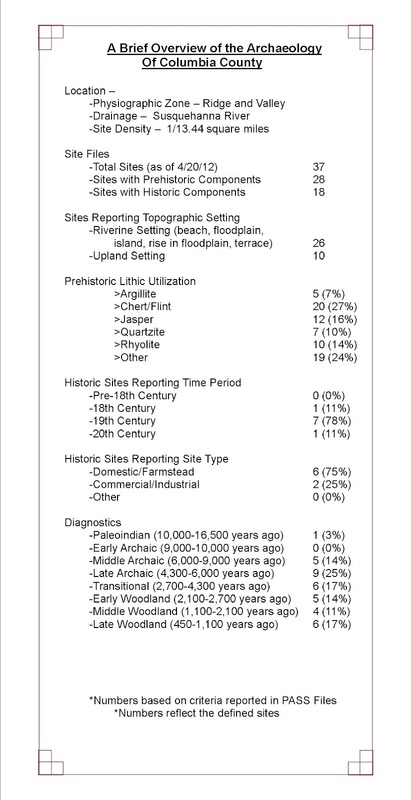 Crawford County has a relatively high density of sites compared to other counties and there have been a number of significant excavations. In western Pennsylvania there are a variety of different chert sources that were used prehistorically and this material supplies 71% of the toolstone used in the county. In addition, Onondaga chert was commonly used in the Upper Allegheny basin and contributes 13% of the raw material for stone tools. The source for this material is the Onondaga chert quarries near Batavia, New York. Cobbles of this material were transported south by the glaciers from western New York. The high quality of Onondaga chert made it highly desirable and pebbles were even used by creating bipolar cores. Surprisingly, metarhyolite from the South Mountain region (a distance of 300 km or 180 miles) is also present. Much of the county was covered by glaciers up to about 14,000 years ago and the retreating ice formed many lakes. These lakes have yielded the remains of Pleistocene megafauna and several mammoth elephant sites have been recorded. Scuba divers initially located the remains and brought them to the surface. A few samples were properly conserved but the bone and ivory that was not, quickly dried out and all but disintegrated. A more detailed examination of the sites revealed that the skeletons were disarticulated and badly crushed, probably by ice. One of the earliest reports in the Pennsylvania Archaeologist concerning the archaeology of Crawford County was by Edmund Carpenter (1950). He briefly reported on six burial mounds in Crawford and Erie counties. They were all very similar in size and construction consisting of earth and boulders or just boulders. The Lawson Mound measured approximately thirty-two feet in diameter and approximately four feet high although it had been leveled by farming activities. It contained a cache of 8 chert projectile points and a double-bitted celt made of slate. The Nelson Mound (36Cw58) was excavated by Harry Schoff (Carpenter and Schoff 1951). This contained two burials in separate stone cists and the remains of one was cremated. 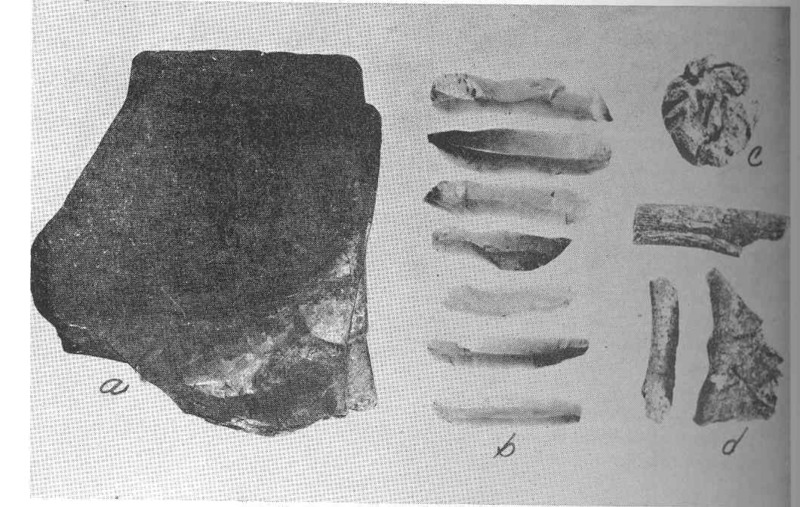 The cremated burial contained a red ochre stained cache of eleven Flint Ridge Chalcedony blades. A lump of graphite and a gray mass of what was once “probably powered graphite that had solidified and now showed the shape and folds of the pouch that once encased it” was also recovered. Nine of the blades were re-fitted and illustrated the shape of the original core. The second burial was flexed and consisted of “badly decayed” skull fragments, teeth and long bones. It was associated with two large sheets of muscovite, a crude slate pendant and a piece of red ochre. Finally, the Danner Mound (36Cw4) was excavated by Neil Clark, Stan Lantz and Bill Robinson with assistance from the Eriez Chapter of the Society for Pennsylvania Archaeology. The remains of three burials were recovered although there were indications that others were present but had completely disintegrated. Grave goods consisted of copper crescents and beads, a polished slate gorget, a celt and two undrilled pendants. These mounds all date to the Squawkie Hill phase of the Middle Woodland period (1850 BP. -1550 BP.). The people who built these mounds seem to be trading with the Hopewell culture (or Interaction Sphere) to the west but not much is known concerning their habitation site. 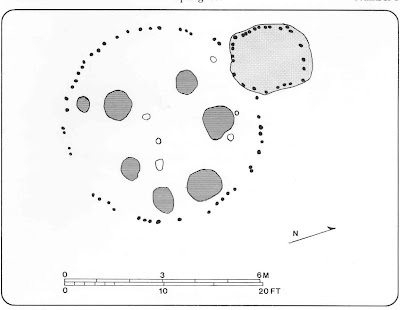 The McFate site (36Cw1) is arguably one of the most significant sites excavated in the county (see also the Wilson Shutes site (36Cw5), another significant McFate phase excavation from Crawford County). This site was excavated by Harry Schoff in 1938 as part of the Works Projects Administration (WPA) initiative and sponsored by the Pennsylvania Historical Commission. The site is situated on the floodplain of French Creek, adjacent to the Nelson Mound (but unrelated). It is actually three overlapping villages – Village 1 with three palisades, Village 2 and 3 with double palisades. Schoff carefully mapped the palisades, houses, burials and 448 storage/processing pits. 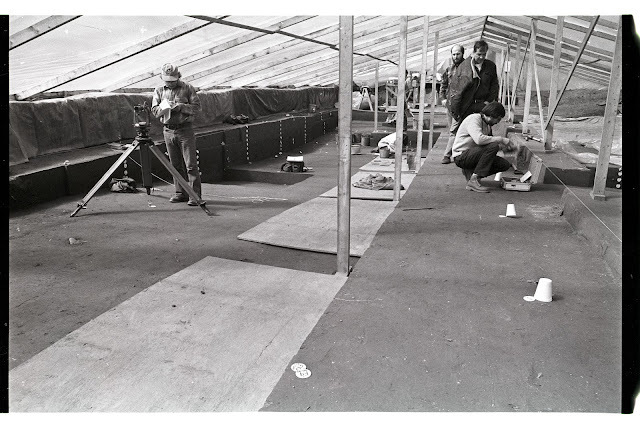 Between 1966 and 1972, the Cussewago Chapter of the Society of Pennsylvania Archaeology, led by Frederick E. Brown conducted additional excavations at the site, exposing Village 3. Village 1 is 120 by 197 feet in diameter. A trench was created on the inside of the inner palisade and the earth was used to support the palisade posts. The village contained circular houses averaging 19 feet in diameter. There were also several storage/processing pits. Semi-detached, post-lined, semi-subterranean storage structures were found with many of the houses. Schoff recorded the contents of each of the pits. Many contained well preserved organic materials such as bone, corn cobs, nut shells, grass pit linings, a fragment of a fiber net (link to blog 6/24/11) and a charred cord wrapped paddle for shaping pottery. The latter is the only example known from the Eastern United States (Burkett et al. 1997). The most common tools are triangular projectile points, pitted stones, hammerstones, bone and antler chisels and celts. Surprisingly, flakes from the production of stone tools were not common and it would seem that stone tool production did not take place near the pits. Considering all of the posts that were made for the palisade, houses, drying racks and storage structures, wood working tools were common. Along with the celts listed above, beaver incisor chisels were also found. 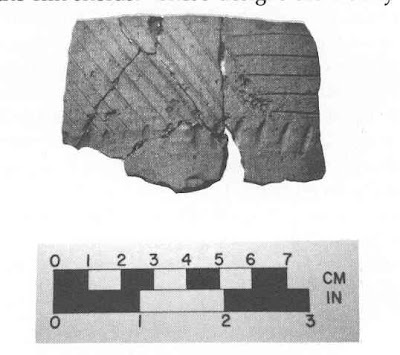 Trumpet shaped smoking pipes are also common at McFate and other sites that contain McFate Incised pottery. The pottery from the McFate site has been classified into three types suggesting the three villages were occupied over a period of at least two hundred years. The latest type was defined by William Mayer-Oakes (1955) based on the ceramics from this site and is called McFate Incised. This is a shell tempered ceramic with incised line motifs of opposing triangles filled with parallel horizontal lines set off by parallel oblique lines on medium to high collars. This pottery is concentrated in the Upper Allegheny (link to blog 6/8/12) but also in the Lower Allegheny basin associated with Monongahela sites. McFate pottery is believed to represent an Iroquoian culture that migrated into southwestern New York and northwest Pennsylvania. By AD 1550, it seems to disappear and the region is abandoned by Native Americans as a habitation area. The field notes, Schoff’s unpublished manuscript, photographs of the excavation and the artifacts from his excavation are curated at The State Museum of Pennsylvania. Unfortunately, in 1972, the site was graded for a housing development and completely destroyed. 1997 The McFate Site and Late Woodland Settlement and Subsistance in French Creek Valley, Northwestern Pennsylvania. Pennsylvania Archaeologist 67(1):4-20. 1950 The Spartansburg Cairns. Pennsylvania Archaeologist 20(1-2):40-46. 1951 The Nelson Mound, Crawford County, Penna. Pennsylvania Archaeologist 21(3-4):57-59. 1960 The Danner Mound. Pennsylvania Archaeologist 30(2):37-45. 1997 McFate Symposium Papers. Pennsylvania Archaeologist 67(1):1-3. 1955 Prehistory of the Upper Ohio Valley. Annals of Carnegie Museum of Natural History 34. The majority of Columbia County is situated in the Susquehanna Lowland Section of the Ridge and Valley Physiographic Province however, a sliver of the central eastern section of the county is included in the Anthracite Valley Section, and a southern portion of the county lies within the Anthracite Upland Section. The North Branch of the Susquehanna River flows east to west across Columbia County effectively bisecting it, with the tributaries of Roaring Creek and Catawissa Creek draining the southern half and Fishing Creek as the predominate tributary draining the county from the north. 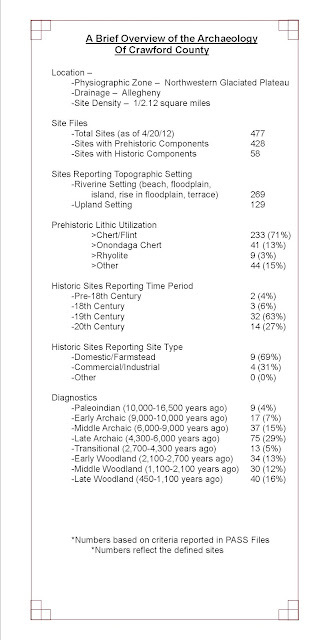 Columbia is second only to Sullivan as the county with the fewest number of recorded archaeological sites in Pennsylvania, 37 to be exact as noted in the graphic above. While not every county can boast many hundreds of registered sites, like Lancaster for example, it would seem that Columbia County has disproportionally fallen through the cracks of site recordation. A modest figure (from an archaeologist perspective at least) just 47,832 artifacts make up all the artifacts from Columbia County housed by the Section of Archaeology. One could debate whether this is a result of “uneven” development driven archaeology – apparently little of which has made its way to the Museum’s Section of Archaeology - or whether there are simply fewer sites “in this neck of the woods” to find in the first place. Not surprisingly, more work done in the area could have the potential to address this question. The Section of Archaeology of The State Museum of Pennsylvania has just seven collections of artifacts from Section 106 compliance projects that represent 14 sites in Columbia County: (4) bridge replacements, (1) municipal airport improvement, (1) telephone co-axial transmission line, and (1) storm sewer project. The storm sewer project, improvements to Bloomsburg Airport and one of the bridge replacements represent the most recent projects for which the museum has artifact collections. The storm sewer project produced a small low density prehistoric site (36Co31) consisting of less than two dozen pieces of lithic debitage, one utilized flake tool and one fragment of fire-cracked rock or FCR. The bridge replacement project yielded a relatively small historic domestic site (36Co29) dating from the mid 19th through early 20th centuries. Artifacts recovered are typical of the site type including fragments of utilitarian ceramic wares, shards of mold-blown and machine made glass containers and vessels, butchered animal bone, slate pencil fragments, spent ammunition, and miscellaneous architectural/building materials. A survey for a co-axial telephone line preformed for AT&T in 1982 identified three sites, two mid – late 19th century historic domestic sites (36Co7 and 36Co8) and one prehistoric site (36Co6) that included projectile point basal fragments diagnostic of the Archaic and Late Archaic Periods. Of the final three remaining collections, all bridge replacements, one stands out on the surface simply by the volume of artifacts recovered. The Mifflinville Bridge replacement project (sites 36Co15, 16, 17 and 18) accounts for 94.5% (45,235) of all artifacts the State Museum holds for Columbia County. It was submitted in May of 2010 via a remedial curation agreement between the Museum, PennDoT and IUP for work conducted in 1988. – The Mifflinville Bridge site (36Co17) is notable for its stratified late Middle Archaic components as this time period is rarely preserved in stratified contexts. There were two main occupations dating to 6890+50 and 7900+70 BP. They contained extensive evidence pertaining to diet and lithic technology. Several hearths produced hickory nut fragments and blood residue analysis produced evidence for the exploitation of the American eel and trout. Netsinkers recovered from this occupation support the evidence for fishing at this time. Also of note is the Catawissa Bridge site, 36Co9. The Catawissa Bridge project recovered a large segment of a Late Woodland Clemson Island hamlet. This site was situated adjacent to a low, swampy section of the floodplain and was repeatedly buried by flood deposits over a 300 year time span. This is one of the few stratified Clemson Island sites and archaeologists were able to trace the evolution of this culture. 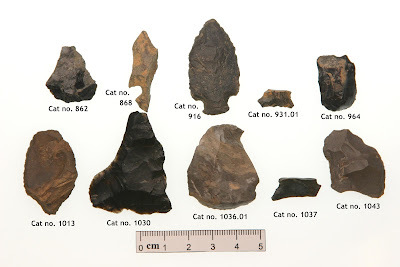 In addition to the CRM projects, a small collection of projectile points from the Ellis Site (36Co12) was generously donated to the museum by a Ms. Dianne Jacobs in 1985. 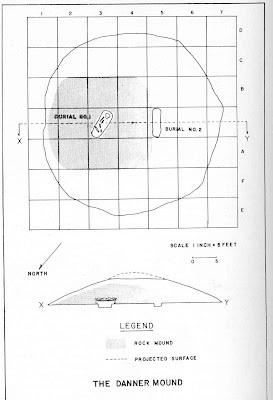 The points seen here are all labeled with the catalog number 1, indicating they were recovered as surface finds, with no other provenience information available, and are most likely the product a relative or herself walking a plowed argricultural field after a hard rain “hunting” for arrowheads. Seen above; the Jacobs donation projectile points range from the Early Archaic at the bottom, through the Late Woodland at the top. 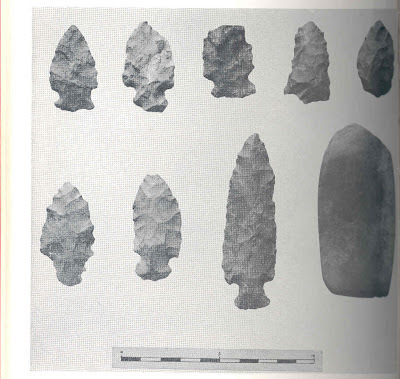 Other, more recent contributors to Columbia County archaeology include an avid avocational archaeologist in the region, Del Beck, who has over the past many years surveyed the length of Catawissa Creek in an effort to identify prehistoric rockshelter sites along its steep slopes. Topographic maps, GIS data points, and photographs of eight rockshelters and associated artifacts recovered were sent to the Section of Archaeology by Del to be officially recorded in the Pennsylvania Archaeological Site Survey (PASS) this past April. Given the sparse amount of data available for the county, Del’s effort in identifying and documenting no fewer that eight rockshelter sites has made a valuable contribution to preserving the past of this seemingly oft overlooked stretch of Pennsylvania. Thanks Del! Notwithstanding the low numbers of registered archaeological sites, Columbia County is quite full of history. A brief review of the Bureau for Historic Preservation’s historical marker database lists eight markers that are specific to the county. Of note are three markers for fortified settlements that endured and defended against Indian attack during the War for Independence. 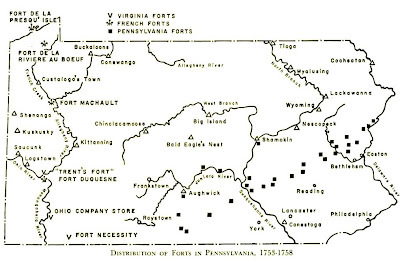 The text of the markers for Forts Jenkins, Wheeler and McClue offers a faint glimps of the often violent struggle between Euro-american colonists and the native peoples in the interior of Pennsylvania in the late 18th Century. Interestingly enough, the next two markers (chronologically speaking) are in stark contrast as they highlight the establishment in the region of Quakers – a religious group long noted for their pacifist beliefs – with the construction of a Friends Meeting House in Catawissa c.1790. 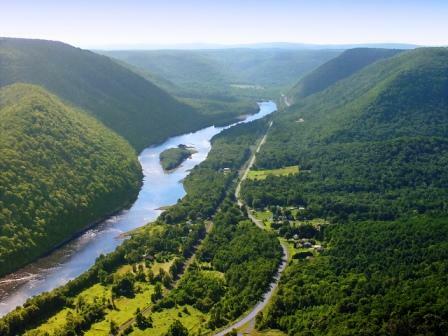 This week we showcase Clinton County which is located in the heart of the Susquehanna’s West Branch valley. Founded in 1839 this county has 898 square miles of land area. Its largest city is Lock Haven which is the home of Lock Haven University of Pennsylvania. Bucktail State Park Natural Area is a 75 mile scenic route from Emporium in Cameron County to Lock Haven. At the Hyner View State Park located at the western edge of the county one can witness a breathtaking view of the West Branch valley and its sparsely populated mountains leading into the Ohio country. Clinton County is situated at the extreme southern end of the Deep Valleys Section, a rugged and deeply dissected plateau composed of shale and sandstone rock. Its principal creeks are Kettle, Young Womans and, Sinnemahoning, which drain into the West Branch river at Keating, Pennsylvania. In the 19th and early 20th centuries, Clinton County was denuded of its primary forests by loggers who harvested huge stands of Eastern White Pine, Hemlock, and later a host of other tree species. Eastern White Pine was cut commercially for ship spars and the leather industry used various components, especially the bark, for tanning cow and buffalo hides. Williamsport was a logging capitol and one of the more prosperous hide tanning facilities was at Phillipsburg in western Centre County. Clinton County has a long prehistory from Paleoindian through Historic. Many sites were recorded after the Agnes Flood of 1972 by William Turnbaugh who used the information for his doctoral dissertation research (Turnbaugh 1972). 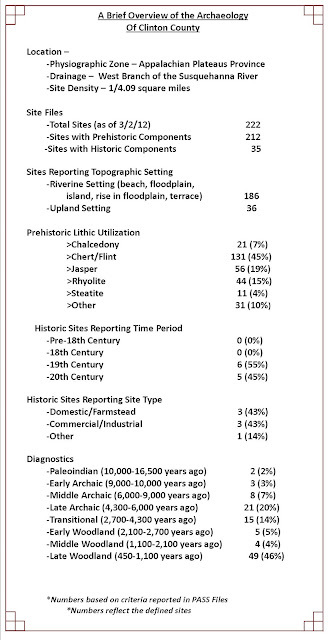 Between 1972 and 1973, 203 prehistoric sites were additionally recorded as part of the Susquehanna River Valley Archaeological Survey (Smith 1976) and four of these were selected for additional investigation as part of a broader archaeological study of the Clemson Island Culture (Smith and Herbstritt n.d.). Other sites were reported through compliance related projects mandated by state and federal agencies. The North-Central Chapter of the Society for Pennsylvania Archaeology, Inc., listed a series of sites with P.A.S.S. 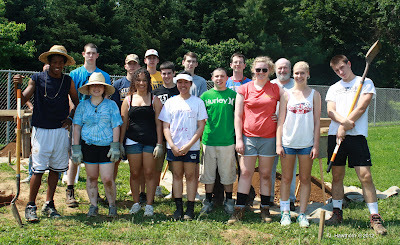 as well and conducts an archaeology field school under the auspices of Lycoming College. During the 18th century, before the general region became known as Clinton County, the West branch was a principal corridor for moving native and Europeans across the frontier. One of the native Indian towns along this stretch of the river at North Bend, Pennsylvania was called Young Womans Town. This settlement is listed on the Skull map of 1770 as Mianquaunk and according to Donehoo (1999) the name Maunquay as listed on the 1759 Skull map as the name of the stream means “place of meeting” where several Indian paths converged. However Wallace (1971) does not show a junction of Indian paths at this location. The Great Island was another place on the West Branch where Indian paths merged. According to Wallace (1971) as many as nine Indian paths converged at the Great Island where Indians came from different regions to parley and trade. The prehistoric landscape of Clinton County was used extensively by Late Woodland groups archaeologically known as Clemson Island, Shenks Ferry and McFate-Quiggle. None of these names actually have a native origin, but, in fact are mere archaeological constructs. Since these Late Woodland groups adopted no written language that could be handed down through subsequent generations their true tribal names will never be known. In the early 1990’s the site at West Water Street on the outskirts of Lock Haven was investigated by University of Delaware staff archaeologists as part of the City of Lock Haven’s flood protection project upgrade (Custer et al. 1996). The site is perhaps best known for its stratified Archaic period deposits (see earlier blog on this subject). As such, suffice it to say that, our focus will be on the later Woodland components at West Water Street site. Postmolds, pit features and numerous artifacts of the Late Woodland Period were recovered that represent the material remains from the three previously named prehistoric cultures. According to Custer et al. (1996) the principal Late Woodland component was Clemson Island marked by two houses and a section of a stockade. Each house measured about seven meters in size that was once home to about 20 people. A large number of pit features were excavated, some of which contained many varieties of broken Clemson Island and Owasco pottery. The pots were used to cooked food since many of their exteriors were covered with accumulated soot. Based on radiocarbon analysis this occupation was about a thousand to eleven hundred years old. Material evidence for site use by Shenks Ferry and McFate-Quiggle groups was limited to a small assemblage of artifacts, mostly pottery. These objects were typical of contemporary ceramics found at other sites in the Clinton County area. A final 18th century Contact period occupation was identified by traces of European manufactured objects of glass and metal from five pits. Some of these were classified as glass beads, rum bottle fragments 9 one of which was made into a scraper), iron ax, lead shot, Jew’s harp, catlinite beads and a piece of leather. Other Contact period items included blue, white and red beads and brass finger rings. Clinton County is indeed an area of the Commonweath that holds a rich archaeological heritage. We hope you have enjoyed TWIPA’s excursion into the past and encourage further interest in the subject by using the following bibliography. 1996 A Summary of Phase III Data Recovery Excavations at the West Water Street Site (36CN175), Lock Haven, Clinton County, Pennsylvania. 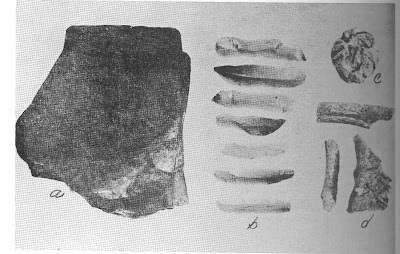 Pennsylvania Archaeologist 66(1):1-53. 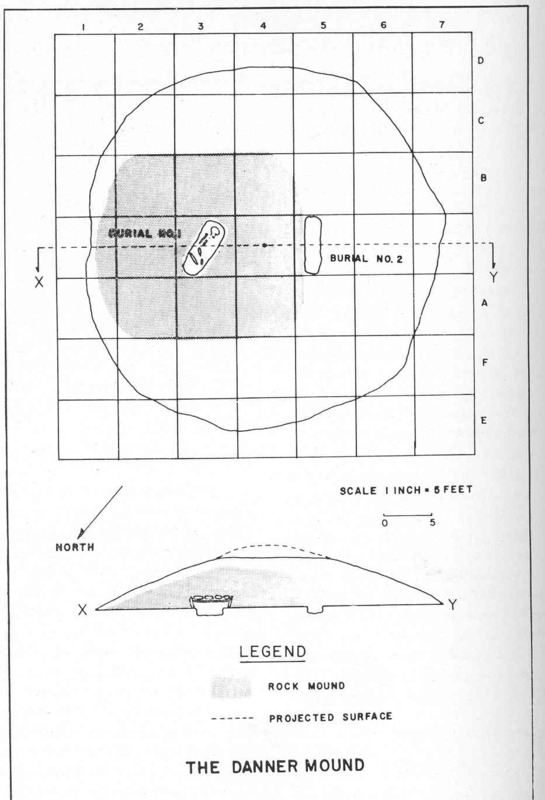 1977 The Susquehanna River Valley Archaeological Survey. Pennsylvania Archaeologist 47(4):27-29.
nd. Clemson Island Studies in Pennsylvania. Unpublished manuscript at the Section of Archaeology, The State Museum of Pennsylvania. This week we return to our archaeological journey by county to Clearfield, still in the in northwestern section of the state. Clearfield County is surrounded by several of the counties covered in our previous blogs including Cambria, Cameron, and Centre. Located in the Appalachian Plateau physiographic province the area is composed of steep ridges and valleys. These stream valleys provided transportation routes through the rough terrain for Native groups settling in the region. The West Branch of the Susquehanna River flows through the county and provided native groups with access to additional trade and transportation routes. The floodplains and terraces of the plateau region provided fertile soils to support plant foods and game animals important to the subsistence of Native peoples. There are 113 sites recorded in the Pennsylvania Archaeological Site Survey Files (PASS), an average of only one site every ten square miles. Evidence of native peoples in Clearfield County have been recovered dating as early as the PaleoIndian period (10,000-16,500 years ago), but the majority of prehistoric sites date from the Archaic period (10,000- 4,300 years ago) through the Early Woodland period (2,700- 2,100 years ago). The Archaic period marks a time of abundant food sources in the form of nuts, berries and wildlife; it also is a period of increased populations. Archaeologists believe that bands came together seasonally for food procurement activities such as nut harvesting or fish migration. Archaeology conducted for a PennDOT bridge replacement project on Lick Run produced archaeological data indicating a Middle Archaic occupation with dates of ca. 7530 and 8210 BP. 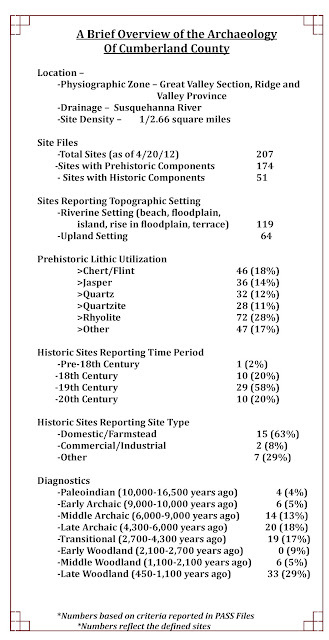 The wide variety of activities in the Early Archaic component of the site, along with the higher artifact density, indicates a base camp. 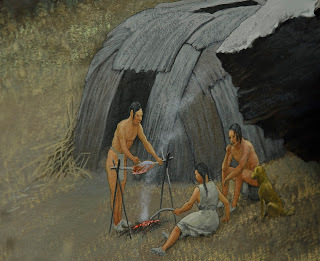 The Transitional period component of the site was represented by a narrow range of activities which indicated a special-purpose camp for processing game Archaeologists also identified seven prehistoric features, three of which dated to the Clemson Island/Owasco phase of the Late Woodland. Woodland occupations were above and mixed within a buried A horizon. These seven features produced radiocarbon dates between 900 and 1130 BP. The presence of ceramics and cooking features in the Woodland Period occupations suggests occupations by family groups, although for relatively short periods of time. Clearfield’s position on the West Branch of the Susquehanna likely played an important role in the procurement activities represented at this site and others in the Appalachian Plateau especially due to its location on an important transportation route. 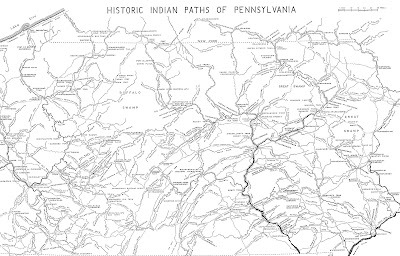 The Great Shamokin Path ran from the Forks of the Susquehanna River at Sunbury to Kittanning on the Allegheny River. This path ran east and west across the state and was an important route not only for Native Americans, but eventually for colonists. The town of Clearfield is located along this path and was known by Native peoples as Chinklacamoose. This town was identified as a Delaware Village dated to 1751 in the publication “A Map of 18th Century Indian Towns in Pennsylvania” (Kent et al 1981: Table 1). During the French & Indian War, reports of Indian raids throughout the region prompted British troops to patrol this area. Historic accounts of Chinklacamoose indicate that when troops from Fort Augusta, located at present day Sunbury, visited the site in April of 1757 they found Chinclacamoose deserted and burnt. The Frankstown Trail which also passed through this village was used to transport captives taken in the raids of the Cumberland and Susquehanna Valleys to Native villages on the Allegheny and other western rivers. The county remained unsettled for several years after the end of the French & Indian War and the first reported settlement was in 1784 by Captain Edward Rickets in the area of Coalport. The rugged terrain, dense forests and few transportation routes contributed to the slow development of Clearfield County. In 1804 the opening of the Erie Turnpike from Milesburg, Centre County into Erie County allowed for easier transport of the first industry in the county- lumbering. Saw mills developed in the region and after initially clearing the valleys close to the streams of white pine, they moved to the mountains and harvested hemlock. This lumber was then either rafted or floated downriver in log drives as sawed or raw lumber. The town of Williamsport on the West Branch of the Susquehanna was a hub for lumbering activities until the forests were depleted in the late 19th century. Archaeology associated for the previously mentioned bridge replacement project also looked at the historic development of the community of Lick Run. 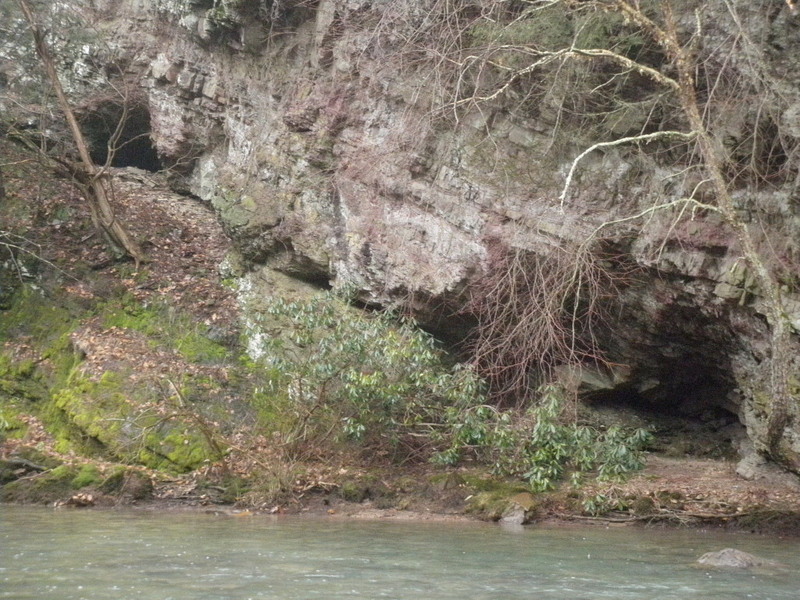 Ellis Irwin and his brother William purchased a partially constructed sawmill, mill and dam across Lick Run in 1856. The Lick Run and Sinnamahoning Turnpike Road Company was incorporated in 1854 to build a road from Lick Run to the Sinnamahoning. This allowed for the development of a community comprised of the Irwin homes, mill complex, school, store and a blacksmith shop. 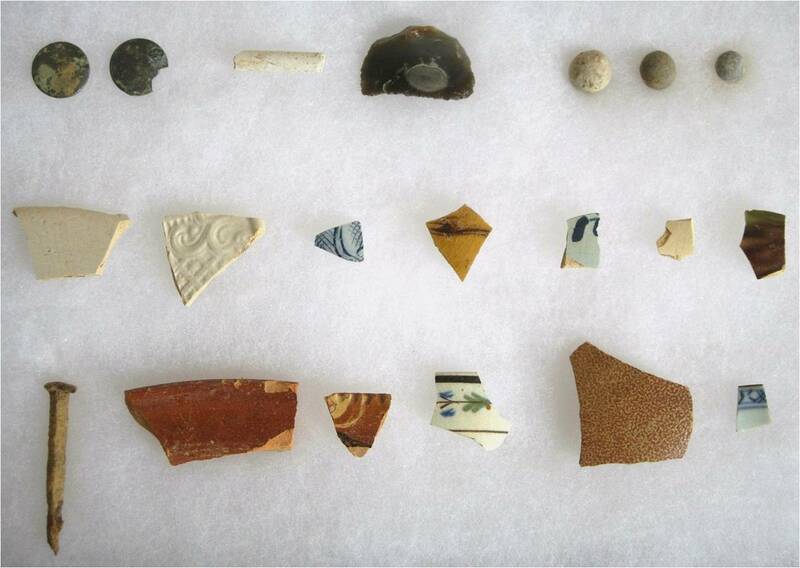 An archaeological investigation conducted at Lick Run prior to the construction of a new bridge recovered personal effects such as buckles, buttons, jewelry and pipe fragments representing members of the Ellis Irwin household. Excavations of the house foundation and well produced a collection of household artifacts suggesting middle class economic status for the occupants. Historic ceramics from the Irwin household. The remaining historic components of the site consisted of a blacksmith shop, a mill race, and stone steps. Historic deposits encountered during data recovery excavations in the side yard included five historic features and a light scatter of historic artifacts. The features included an historic postmold, a stone pavement, a rock cluster, and two trash pits. Artifacts consisted primarily of architectural debris, container glass, and a small number of ceramics. The archaeology conducted at this site and many others across the Commonwealth aid archaeologists in examining the past and recreating a picture of our heritage. The history books may have recorded the mill at Lick Run, but it didn’t record the details of everyday life for the Irwin family. The tangible evidence of peoples before us help us to analyze changes in social structure, patterns of movement, consumerism and multiple other indicators of human activity. Preserving our archaeological heritage benefits all of us and we hope you will be inspired to learn more about the archaeology of your county and to help us preserve and protect our archaeological heritage for future generations. We have a brief follow-up report on the mock archaeology project at Cedar Cliff High School reported on in last week’s blog. Archaeologists at the State Museum assisted students this week with their final excavations. Students are busy looking at the artifacts recovered and analyzing their findings and preparing a report of their conclusions. A brief session on curation was provided to the students so they could learn about the importance of retaining provenience information for each artifact and preparing collections for long term curation. The students learned a lot and demonstrated an applied knowledge of archaeology both in the field and the classroom. Our thanks to Mr. Dan Reilly for inviting us to participate in this educational outreach program. 1928. A History of the Indian Villages and Place Names in Pennsylvania. Pennsylvania Historical Commission. Harrisburg. 1981. 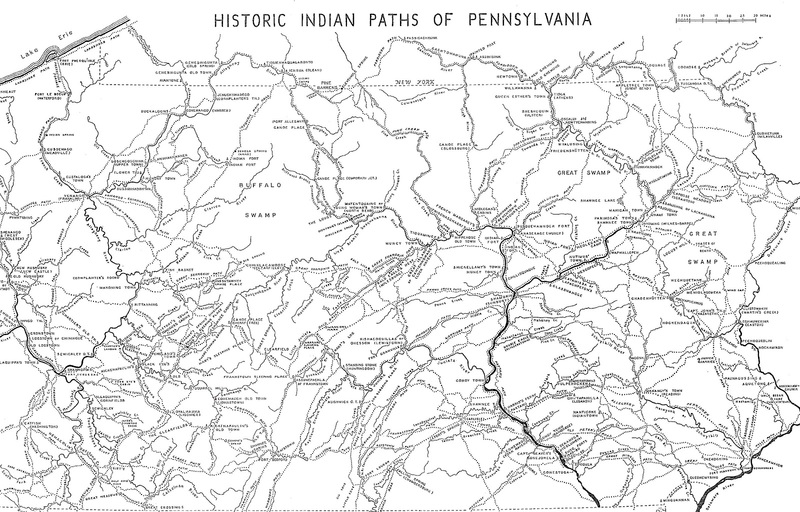 A Map of 18th Century Indian Towns in Pennsylvania. Pennsylvania Archaeologist 51(4):1-18.